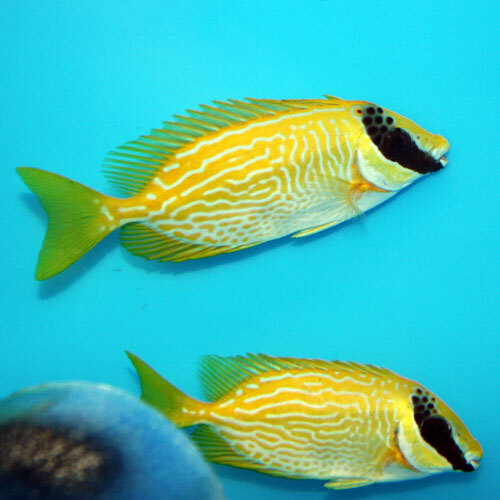 Also known as the Bluelined Rabbitfish, these fish make good additions to a reef tank, but they need a good sized tank as they grow quite large. Care needs to be taken with them, as their spines are poisonous and when stressed, they will flash and point them at any fish or hand that is placed in the tank. Their sting is similar to a Lionfish, and if stung, you should run you hand under hot water until the pain stops. If that doesn’t work, place your hand under the hot lights MH, or see a doctor. At night, Rabbitfish like to hang in the water motionless or up against pipes or rocks with their spines out, so you need to be careful when placing your hand in the tank as not to touch the spines. Rabbitfish are big algae eaters, and will consume large amounts in the tank, including hair algae; a sheet of nori, mysis shrimp, and vegetarian flake food should be offered at least 3 times a week. These fish will get along with most reef fish without any problems, but since they’re somewhat passive, you need to be careful that tank mates aren’t too aggressive.